POET’s biorefinery in Jewell, Iowa has been a shining example in the ethanol industry since 2006. It was 2005 and the green flag was out for the ethanol industry. In 2005, ethanol was still a young industry, but not so young that Iowans hadn’t noticed the positive transformation it could bring to rural communities. Jewell, a progressive community of 1,200 planted squarely in some of the very richest corn-growing soil in the world, was quick to recognize a good opportunity when it saw one. The plant commenced operations on March 1, 2006. Monroe says that Jewell was the first POET plant to be built for a 60 million gallon per year nameplate capacity. There were a few bugs to work out initially, but soon the plant became a perennial top performer in the POET family, and the design pattern for all POET plants built since. 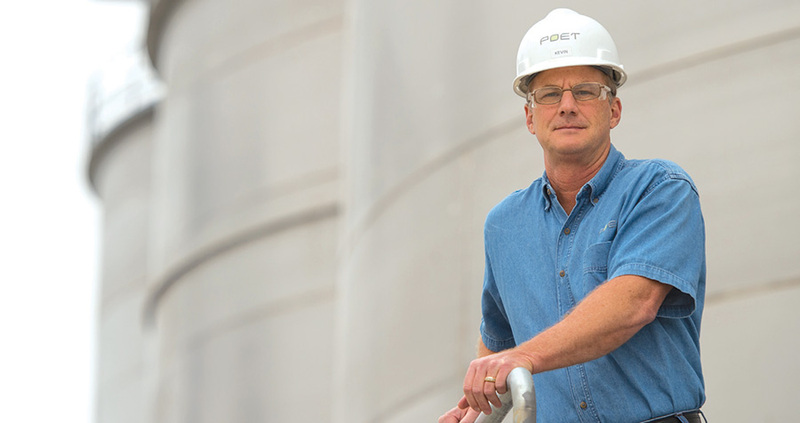 After adding Total Water Recovery, the plant now uses the least water per gallon of ethanol produced at any POET plant. And it has also received a virtual trainload of awards for everything from rail chemical safety, to economic growth and achievement, to FFA appreciation. Those achievements and accolades pale in comparison, however, to the pride and pleasure Monroe takes in his workforce. Those characteristics also spill over into the community, where employees are generous with their time and their financial resources in a plethora of community causes, with a special emphasis on schools and young people’s activities. That attitude sometimes carries even beyond the community, where Monroe reports that employees were enthusiastic about the plant’s recent Project GAIA donation of ethanol for cook stoves in Haiti. All of which leads Monroe – who got his college degree in geology, ironically with the idea of someday working for an oil company – to a simple conclusion. While he’s proud to be part of an industry that’s making a difference across the nation in the environment, energy independence, and rural development, those things still are not his number one job satisfaction. 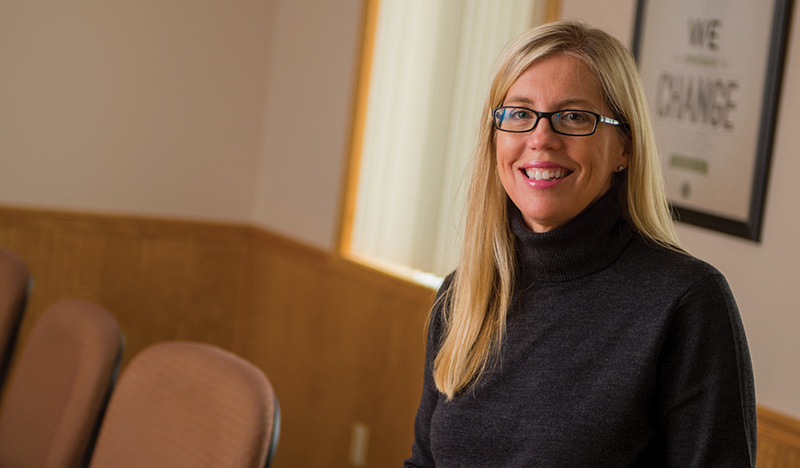 Hired before the plant even started construction to handle investor relations, Administrative and Accounting Assistant, Julie Lutjen has pretty much seen it all – investing, groundbreaking, construction, grand opening and day-to-day operations. Lutjen, who is a Jewell native, mother of four sons and serves as her church organist, lives with her husband David on the farm where she grew up. Besides her family, she says she has two loves – her job and her community, and that they complement each other well. Jewell’s Operations Manager Andrew Samp grew up in northeast Missouri and remembers his introduction to ethanol very well. As a high school student, he went with his dad to a producer meeting for what was then a prospective plant at Macon. There he met POET Founder and Executive Chairman Jeff Broin, and what he heard made an indelible impression. “I remember Jeff telling farmers about the potential of ethanol to create a new market for corn, put it to good use, and get away from the government supporting overproduction,” he recalls. 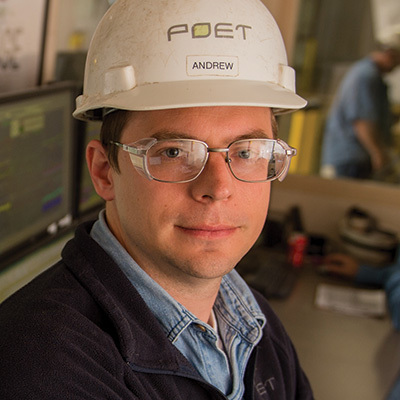 After earning his degree in agricultural business from Northwest Missouri State University, Samp went to work for the Macon plant as an Operator. Then in 2006, he came to the Jewell plant as Operations Supervisor. About six months later he was promoted to Operations Manager. “At first, I didn’t plan on making a career out of it, but the industry has continued to offer me opportunities,” he says. A married father of four young children, Samp enjoys many aspects of his job, but especially likes the challenges. Retired Jewell pharmacist Fred Marcalus is a longtime member of JADE (Jewell Area Development Enterprise) and is rightfully proud of the fact that his city is a Main Street Community. Marcalus likes to think that Jewell’s being a healthy and accepting community had something to do with POET choosing it as a site for their new plant in 2005. He and many others were glad they did. Since then, that initial positive impression has been confirmed.